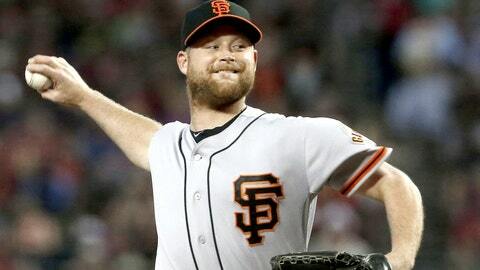 Chad Gaudin was 5-2 with a 3.06 ERA in 30 games last year for the San Francisco Giants. Right-hander Chad Gaudin has signed a minor-league contract with the Philadelphia Phillies and will be invited to spring training. Gaudin was 5-2 with a 3.06 ERA in 30 games last year for the San Francisco Giants. He made 12 starts and held hitters to a .227 batting average. The Phillies announced the move on Tuesday. The 30-year-old Gaudin began last season with 18 relief appearances and posted a 2.05 ERA in those games before moving to the starting rotation in June. His season ended in mid-August when he was placed on the disabled list with carpal tunnel syndrome. Gaudin is 45-44 with a 4.44 ERA in 344 games, including 87 starts, for Tampa, Toronto, Oakland A’s, Chicago Cubs, San Diego, New York Yankees, Washington, Miami and the Giants.